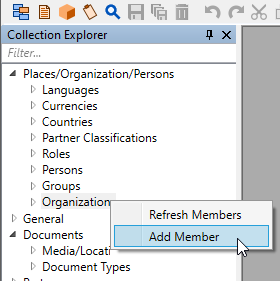 Create a new member by selecting the collection, then opening the context menu and selecting Add Member or, for some collections, Copy Default to Add Member. Add Member: Create a new collection member using the normal settings of the collection. Copy Default to Add Member: If this is shown, create a new collection member by copying the default (bold) collection member. You can set the collection's default member before copying, and restore it after you're done copying. You can also select the Item | Create New Member menu item (keyboard F8), or click on the New Member toolbar button ( ), to launch the New Member Wizard. When the member's new window opens, enter appropriate information for the new member. Save your changes by closing or locking (Edit | Lock Object or F2) the window.